If you love to entertain outdoors even in cooler weather, setting up proper outdoor heating is the key to enjoying your backyard to the utmost. When the cooler time of year rolls around and temperatures plummet, this is often a great excuse to enjoy an outdoor fire and spend time with friends and family trying to stay warm and toasty. There is more than one way to heat an outdoor space. The simplest option is to purchase a wood and pellet burning fire pit – the most elaborate solution involves installing a large outdoor fireplace that runs off gas. In the end, the type of outdoor heating you select will be determined by what you need, your budget and by the look you want for your patio or backyard garden. fire pits are entirely portable so you can move them around your patio or garden to wherever heat is needed. outdoor fireplaces are often fueled by gas, it’s very easy to get a fire going. Outdoor fireplaces do have some disadvantages however. They can be expensive. You can only install it in one spot, and don’t have the option of moving it at a later date. You also have to plan ahead and make sure the fireplace integrates well into your dÈcor and meets local government requirements. Chimineas are another option to consider. They are a great way to add a unique look to your backyard and keep you warm. They are beautiful works of art that provide heating for a large area. 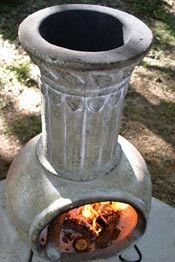 chiminea is a simple or rustic fireplace made out of clay. Traditionally, they were used for heating the home and preparing meals, but today they have been adapted to modern life and make great space heaters for outdoor use. In the past chimineas were made out of a single piece of fired clay, but today they are constructed out of more than one type of material. You can still find them in clay if that is what you’re looking for, however they’re also available in cast iron and cast aluminum. Patio heaters are a popular choice for outdoor heating. They are reasonably priced and are portable so can be moved around the patio or garden as required. They come in free standing or table top. Ensure that you determine the area you wish to heat prior to purchasing a patio heater. The more heat required, the more powerful the patio heater needs to be. Also ensure that the patio heater is fairly stable and has an anti-tilt shut-off device. Finding the right space heater for your backyard patio or garden doesnít have to be difficult. Do your research and you should be able to find something that works well for you and your family, at a price you can afford. Visit Outdoor-heating-guide.com – A consumer guide to outdoor heating including safety tips for outdoor fireplaces, firepits, infrared patio heaters, tabletop patio heaters, chimineas and gas outdoor heaters.